FILE - In this March 15, 2016 file photo, National League for Democracy party (NLD) leader Aung San Suu Kyi arrives in Manama's parliament in Naypyitaw, Myanmar. More than two years after taking power and almost halfway through its term, there are mixed opinions of how Myanmar's National League for Democracy Party is doing when it comes to meeting campaign promises. Its efforts, observers say, have been hindered by the military’s continued role in politics, but even in areas where the party has direct control, critics say progress has been limited. There was a tepid response when the NLD unveiled its manifesto ahead of the 2015 general election, the vote which swept the party to power and ended years of authoritarian, military rule. The 20-page document spoke of issues including economic development, constitutional reform and national reconciliation, but received criticism from skeptics for lacking details on how those sweeping changes would be carried out. An important component of that manifesto were promises to ensure economic development in a country that saw slow growth under decades of military rule and the isolation that resulted from it. The document promised to improve infrastructure, develop the agricultural sector and to protect the environment. Progress in these areas has been mixed, and there is frustration among some — particularly international investors — on what they view as the slow pace of reforms. There has been some progress, however. In December, the government approved the much anticipated Companies Act, which is due to be fully enacted in August. Foreign businesses have expressed excitement about the new bill, which is expected to make doing business easier in the country. Another step forward came earlier this week, when the government announced that foreign owned companies will be allowed to operate in wholesale and retail trading. “This is without doubt a very large step in the right direction and will encourage renewed interest in investment in Myanmar,” said Jo Daniels, a managing partner of the U.S.-based investment law firm Baker McKenzie, which has offices in Yangon. “Unfortunately the large capital requirements are likely to mean that only the larger enterprises will benefit,” Daniels said in a briefing note. But foreign investors have also been reluctant to commit in Myanmar because of other factors, especially the ethnic conflicts that are flaring in the country’s borderlands. 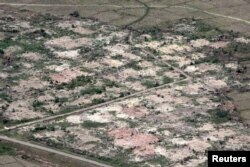 FILE - An aerial view shows burned down villages once inhabited by the Rohingya seen from the Myanmar military helicopters that carried the U.N. envoys to northern Rakhine state, Myanmar, May 1, 2018. Since August, international headlines on Myanmar have focused on the brutal military campaign against the Rohingya population in Rakhine State. In recent weeks, attention has been focused on Kachin State, where thousands have been displaced — and many remain cut off from humanitarian aid — by renewed fighting between the Tatmadaw and the Kachin Independence Army. FILE - Kachin Independence Army fighters walk in a jungle path from Mu Du front line to Hpalap outpost in an area controlled by the Kachin rebels in northern Kachin state, Myanmar, March 17, 2018. The civilian government has little control over the military’s actions, but it has done very little to improve relations with ethnic minority groups, said Stella Naw, an advocate for and member of the country’s Kachin population. 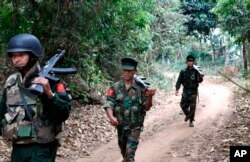 “The NLD’s failure to speak out when innocent people are being attacked by the Burma Army, as well as the fact Aung San Suu Kyi is repeatedly urging the Kachin people to pressure the KIO [Kachin Independence Organization] to sign the Nationwide Ceasefire Agreement, made them believe that she doesn’t understand their concerns and changes,” Naw told VOA. “She has no interest in representing the Kachin people’s needs and future political vision — for equality. She is no different than any other central Burman leader from the past,” she said. Myo Nyunt, an NLD spokesperson, defended the party’s relations with ethnic minorities, saying it had worked to improve trust with the groups, as well as with the Tatmadaw. “Our leader, Daw Aung San Suu Kyi, has [worked] for national reconciliation,” he told VOA. “To get change, we need to emphasize more and more,” he said, adding that the decision to change the president was one step towards the party fulfilling its campaign promises. The NLD also campaigned hard on a promise to amend the military-drafted 2008 constitution. Observers say substantial changes to the charter were always going to be difficult, given the military’s power. They were made even more challenging in 2017 when prominent lawyer Ko Ni, regarded as an expert on the document, was assassinated outside Yangon Airport. However, a new report published earlier this month argued that constitutional amendments are possible, if they focus on issues such as decentralization and federalism, instead of the “democratic” aspects of the charter. “[Decentralization] is fundamental, both politically and administratively. All politicians feel a need to have broader, and real powers, which they could actually practice. Civil servants think the same thing. Even business owners and civil society activists know that Myanmar cannot be ruled by a handful of people in Nay Pyi Taw if the country is to continue to open up politically, and succeed economically,” he said. Aung Naing Soe contributed to this report.